Benefits: Aloe vera can keep your skin clear and your hair dandruff-free and soft. It is antimicrobial in nature so it keeps your skin, hair and body free of unwanted bacterial growth and inhibits any infection. It also cleanses your stomach and clean tummy is proportional to clear skin. Benefits: Baking soda is a wonderful all-purpose ingredient. It cleans the scalp effectively, keeps skin clear by inhibiting bacterial growth and cleansing the pores and also keeps you odour-free. Benefits: turmeric is antibacterial and anti-inflammatory in nature. It can soothe cold and cough symptoms and also treat acne and a number of skin problems. Its healing quality can be used to heal minor fresh wounds too. It can also sooth toothache and heal cavities overtime. Ways to use: Drinking turmeric milk or golden milk before sleeping helps with cough and cold. For acne and other skin problems, simply make a paste of turmeric and milk and apply it on the skin. Wash off after 20 minutes. To heal wounds, simply sprinkle pure turmeric powder on the fresh wound and tie a bandage. To heal cavities and sooth toothache, apply turmeric powder on the tooth and gums and leave it overnight. Benefits and recipe of Turmeric Milk. Benefits: Garlic offers antibiotic and antiviral benefits that make antibacterial properties make garlic a wonderful treatment for cough and cold. It also soothes and heals oral thrush. If you have toothache, garlic can come to rescue as it has analgesic properties too. Benefits: Ginger is antibacterial and anti-inflammatory in nature which relieves cough and cold. It also inhibits bacterial growth in the stomach which makes a great medicine for stomach problems like in digestion and constipation. Ways to use: Add ginger powder in your daily food to boost immunity. Add it in your tea to fight cold and cough. You may also simply let ginger powder simmer in water and consume warm after straining to relieve stomach problems. Natural herbal remedies using Ginger tea. Benefits: Honey is great to treat a number of skin problems like psoriasis, acne, dry skin, minor wounds, burns, cuts etc. due to its antimicrobial and anti-inflammatory nature. It also moisturizes the skin to heal dry patches and also is beneficial to hydrate and moisturize your hair and scalp. Its anti-inflammatory nature soothes cold and cough symptoms. Benefits: Lemons are acidic in nature which suits out skin and internal body pH and hence can be used for skin, hair and body. It is anti-microbial in nature that can be used to treat a number of ailments. Benefits: Coconut oil is a great moisturizer due to essential fatty acids that lock in moisture and provide skin with nutrients. Its antimicrobial nature can keep your skin clear and squeaky clean. Also, it makes your hair thicker and keeps dandruff at bay. Benefits: Onions helps promote blood circulation to the scalp and boosts production of collagen necessary for new hair growth. Its anti-inflammatory nature soothes the cold and cough symptoms. Benefits: Fluoride in tea boosts bone and oral health. It also helps in curing digestive disorders and also prevents nausea. Have gray hair? Green tea can stimulate hair follicles and reduce gray hair over time. Ways to use: Black tea can be used as a mouthwash in order to boost oral health. Drink it regularly to keep digestion working smoothly and also make bones stronger. If you have grey hair problem, use black tea as last hair rinse- it acts as a natural dye and also makes your hair darker gradually. Top 15 Home Remedies Using Tea. Benefits: Apple cider Vinegar is acidic just like lemons and can be used to keep skin clear, hair and scalp healthy and is also a fat burner. Benefits: Yogurt is abundant is good probiotic bacteria that keeps your metabolism in top condition. The lactic acid in yogurt helps fight dandruff and keep your skin clear and soft. Benefits: Mint can treat symptoms of irritable bowel syndrome such as stomach cramps and bloating. Mint also helps alleviate different types of headaches, such as migraines, stress-related or tension headaches. Mint also helps heal acne faster and prevents it from coming back. Ways to use: Drink mint tea to treat symptoms of IBS and headaches. To make this tea, add 1 teaspoon of dried mint leaves to a cup of boiling water. Cover and steep for 10 minutes. Strain and drink it. To treat acne, apply a paste of mint leaves on the face and wash off after 15 minutes; do this until the acne completely dries off. Morning Detox tea recipes for healthy body and glowing skin. Benefits: This herb is highly beneficial for people who have diabetes. It improves glucose tolerance and lowers blood sugar levels. For nursing mothers, fenugreek helps stimulate breast milk production. Fenugreek seeds and leaves both help reduce acne and refine your skin’s texture. Ways to use: If you are diabetic or nursing mother, soak 1 to 2 tablespoons of fenugreek seeds in a glass of water overnight. The next morning, drink the water as well as chew the seeds on an empty stomach. Do this daily. To help with the acne and scars, soak fenugreek seeds in water overnight and make a paste of it in morning, apply on face and wash off after 20 minutes. Benefits: Cumin is a popular ingredient in Ayurveda for digestive problems, such as stomach pain, indigestion, diarrhoea, and morning sickness. Cumin also helps prevent and treat bloating. It also induces lactation. Benefits: Cinnamon is a great weight loss ingredient as it is a fat burner. Cinnamon also heals and provides relief from common colds and flus. Diabetic people can benefit from cinnamon as it lowers blood sugar. Ways to use: Add cinnamon in water and let it simmer. Strain and consume dai8ly to lose weight. If you have a common cold or cough, make a mixture of lukewarm honey and one-quarter teaspoon of cinnamon and drink it twice daily, after breakfast and before bed. Regularly consuming less than one-half teaspoon per day reduces blood sugar levels in individuals with type 2 diabetes. 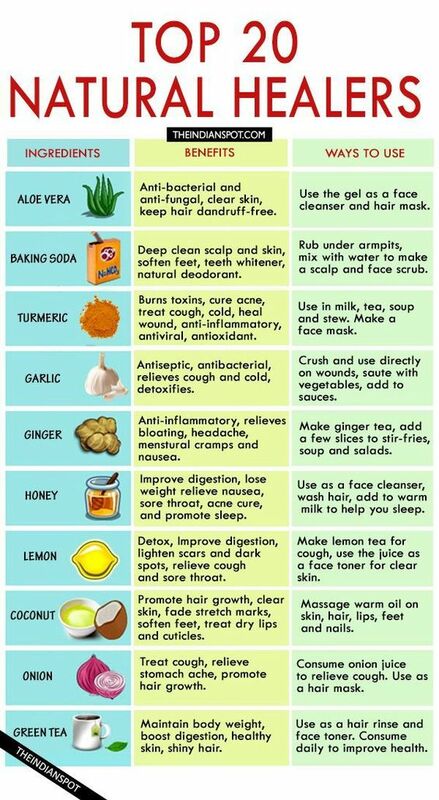 Home remedies using Cinnamon and honey. Benefits: gluten-free whole grain and a great source of important vitamins, minerals, fibre and antioxidants. They are also rich in anti-oxidants and fibre. Besides, they also help keep skin clear and moisturize it. Ways to use: Have oatmeal every morning to keep your metabolism running in top condition and also to keep your weight in check. Since it is rich in anti-oxidants and have moisturising properties, apply the paste on your face and wash off after 15 minutes to keep your skin tight, clear and soft. Benefits: Olive oil lowers cholesterol, reduces high blood pressure, fights inflammation in the body and aids weight loss. It is also has skin and hair moisturizing properties. Benefits: Fennel seeds can detox your body and is an excellent remedy for bloating, menstrual cramps. It is also a great natural breath freshener. Ways to use: Make fennel water or fennel tea but stepping fennel seeds in hot water to get rid of bloating and menstrual cramps. Chew on fennel seeds to freshen breath. Fennel water benefits. Benefits: Buttermilk soothes the stomach, fights acidity and is beneficial for a number of stomach problems. It also improves complexion and heals acne. Ways to use: Add mint paste to buttermilk and consume after having a spicy food or when you feel your stomach is not behaving properly. You can use a cotton ball to apply buttermilk on face and leave it overnight to treat acne and inflammation on the skin. Previous Post Did you Know ! Ms-Word Shortcut Keys ?